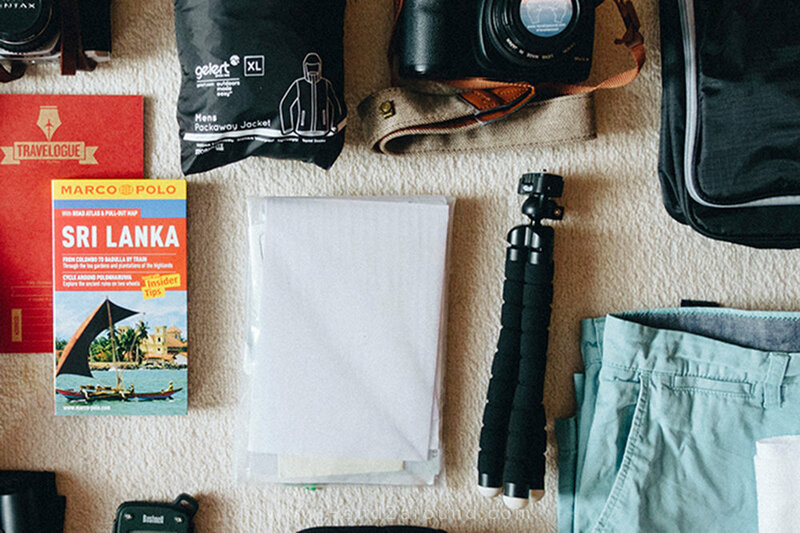 One of the most common things we get asked is what's in our camera bag. When people see our works, they often wonder how we can move around the world, only with our backpacks, yet capture high quality footage or photographs. That's why, we decided to go through our two camera bags, which we carry with ourselves all around the world (in dust, heat, cold, in cars, on buses, airplanes, camels and donkeys), and share with you what cameras, lenses and accessories we use during our commercial projects, and to capture travel films, vlogs and photographs. Our Canon 5D Mark II is reliable, efficient and an all round excellent camera for photography. Our oldest piece of equipment in our camera bag that has always been there! Even though it's a bit outdated, the quality of images it produces is pretty amazing. 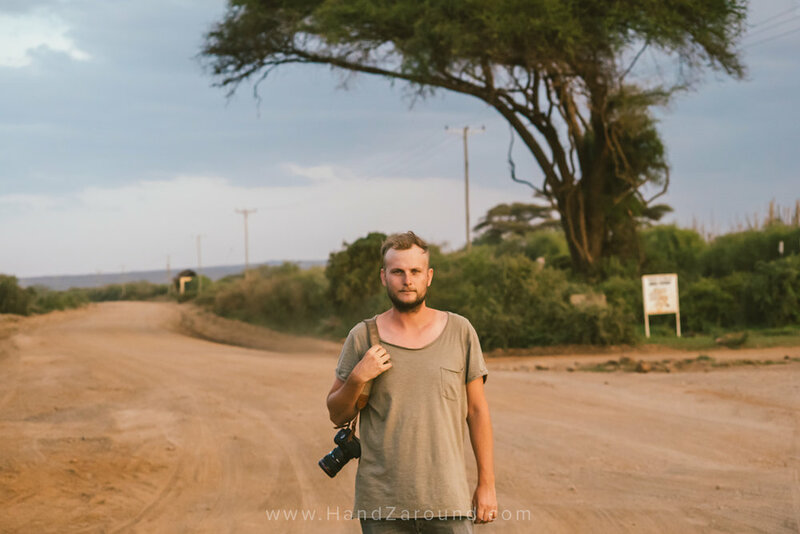 Zach in Amboseli (Kenya) with our good old Canon hanging down his arm! Our Sony A7S II is the newest addition to our camera bag! A powerful beast with amazing performance in lowlight situations. We love for the sharp images it produces, the low grain even at very high ISO speeds and because thanks to an adapter it lets us use our Canon lenses. It can film 120 fps in 1080 HD, this equals awesome slow motion in great quality. It can also film in 4k and has a big selection of colour profiles. It has definitely made our recent footage look so much more professional! Our Sony RX100 Mark IV is definitely a little workhorse. Some say it isn’t a professional camera, but it has brought us many project opportunities (including paid ones) and has helped us to create most of the films we have in our portfolio. It's small but certainly mighty! An excellent choice for travellers. Not only does it fit in the palm of our hand, it also has the ability to film 4k, and in 120 fps in 1080HD, as well as take RAW photographs. It also has a range of colour profiles and when you balance it on a gimbal, it can capture them cinematic shots! Only downside is that it doesn't perform in lowlight too well and the battery-life is poor, but we always found a way around these disadvantages. Small, compact and so easy to use on the go. With a built-in lens it makes it ideal for those spur of the moment shots like when we saw the monkeys swinging in the trees just outside our room. DJI Mavic Pro Drone is one of the best additions to our camera bag. It's small, light and compact! Ideal for travelling to places where drones are not looked upon that kindly, as it is so discrete. It tucks away easily into our bags and takes less than a minute to unpack and start flying. It can capture 4k footage, slow motion, RAW images and has a few colour profiles to choose from. The battery life could be better (approx. 20-22 mins of ‘safe’ flying time), and we've had a couple lost signals along the way, but we don't let these hold us back from capturing awesome aerial shots. Zach taking the Mavic for it's maiden voyage through the hills of Hanna's hometown in Poland. Our Go Pro Hero 4 is the last resort when it comes to filming on land, but we often use it underwater. We mainly use it when we know we're going to get wet or super dirty. It is able to capture 4k and film at a 60 fps, which allows a bit of slow motion in post production, but we don't like that it has limited choices when it comes to settings and colour profiles. Exploring the waters around Phi Phi Island in Thailand with our GoPro in hand. It took us a while to learn how to use our Feiyu Tech MG Lite Gimbal, but now we use it pretty much every time we film. It's relatively small with a handle that unscrews for easier storage. It has an app that allows you to check settings and control it from your phone and once you get the hang of it, it's pretty easy to use. Without it, we certainly would not be able to get the cinematic look in our clips as it is so much more versatile than a stationary tripod. It works both, with our small Sony RX100 IV and the bigger Sony A7S II. This fully extendable tripod is so lightweight, but still quite sturdy. It folds away to a reasonably small size and is very quick to set up and pack away. Ideal for capturing long exposure and HDR shots, and doesn't weigh us down. Our tripod lives on the side of Hanna's backpack. Our little flexible tripod is a handy little piece of equipment that helps to get the camera into some pretty funky positions. Its sturdiness started to wear off fairly quickly, probably because we used it with our chunky Canon 5D M2. But it's ideal for smaller cameras or filming vlogs with your phone. Good old bendy has been with us since the start - here he is all lined up with some of our essentials before we left for our travels in 2016. The very bright Canon EF 50MM F/1.4 lens is of great quality, and perfect for portraits or close-ups. We love the bokeh it creates and it works so well in low light conditions thanks to it's wide aperture. This 17-40mm Canon lens is perfect for capturing architectural shots, tight spaces and landscapes. 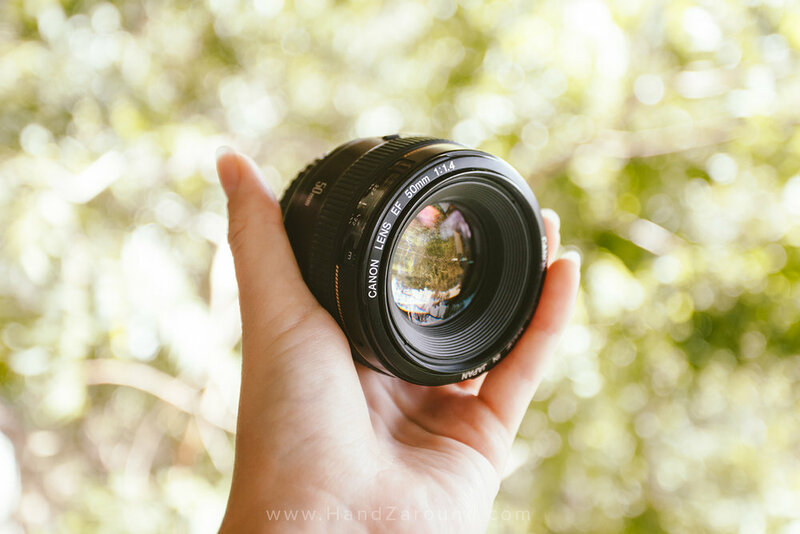 The zoom is all housed within the body of the lens so we don't have to worry about any mechanisms failing during transport. It's also quite versatile with its 17mm letting you achieve quite a wide angle and 40mm letting you capture more portrait-like shots, if needed. 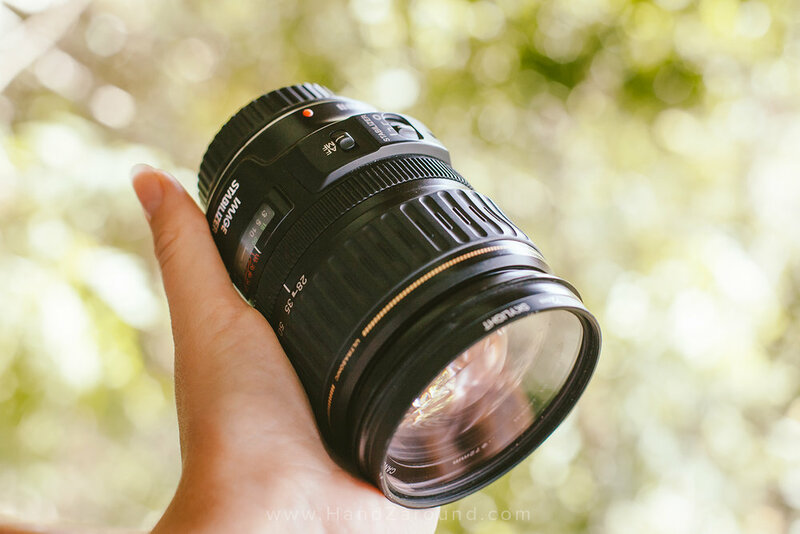 The 28-135mm Canon lens is not so good quality-wise but it has two main advantages - it has image stabilisation which helps for filming handheld and it lets us capture shots wide enough for landscapes at 28mm, and close enough for capturing things that are in distance, at 135mm. Good all round lens in a situation when you know you won't be able to change between wide angle and tele lenses. This affordable tele-lens Sigma 70-300mm is not the brightest lens but it still gives a lovely bokeh when used at 300mm. We're not really into wildlife photography so we didn't want to invest too much money into a high quality tele lens - this one was a great solution and a compromise between affordability and quality. Not a very excited piece of equipment but very essential. This Metabones Mark 5 adapter is a medium term fix as it allows us to use lenses from Canon. Whilst some of our lenses work quite well, others just don't keep up with the autofocus. It's not an ideal solution but has saved us a lot of money as we didn't have to buy expensive lenses for our Sony A7S II. We bought this simple Comica microphone to record sounds for vlogs and interviews. It's perfect for quick plug-in into the camera and use on the go. It comes with the dead cat windshield, perfect for windy situations. Hanna waiting to capture some interviews of the trekkers and Massais on our latest adventure through Kenya. We really love our National Geographic Camera Bag and our canvas backpack. The first one is super useful because of all the different compartments (so many of them for lenses, memory cards, pens and personal belongings). It's especially convenient due to quite big main compartment at the top that can store your personal things (for one day of trek) or, like in our case, the gimbal, which doesn't have to be dismantled. The bag is made of durable fabric, which absorbs humidity, and on the inside it is heavily padded to prevent anything from breaking. It also has a separate laptop compartment for quick access. Our other day backpack is just a regular backpack with enough space to carry everything else we need, we bought it in Laos and we have loved it ever since. It consits of two compartments divided by a zip. Thanks to that, we can store our gimbal vertically without dismantling it, whilst still storing our DSLR and lenses in the bottom compartment, and a laptop in the back. What about you? 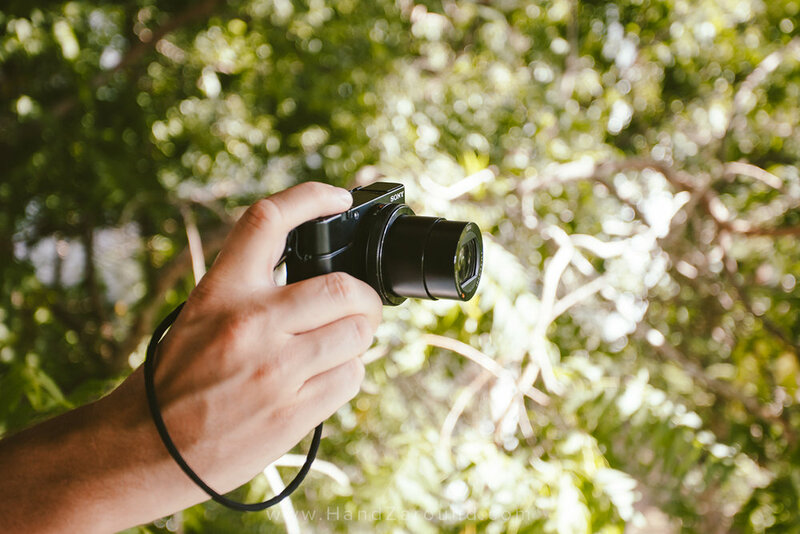 What equipment do you use to capture your travel or holiday shots? If you want to share with us your story or have any questions, let us know in the comments below!